William is a 14 year old Judo athlete from Balcombe and has a busy training schedule with club, and England training taking place regularly. In addition to his 2-3 times a week training schedule at his club, Kin Ryu Judo, and his cadet England training session, he also took part in a European training camp in Sweden for 3 days at the beginning of May. This was run by the French National Coach Pascal Locarini and Sophie Cox, one of the GB National Coaches. William has also taken part in the Sussex Championships and won a gold medal in the under 38kg group to be Sussex Champion for 5th year in a row; pleasingly he was awarded the boys spirit of judo award for recognition of how he conducted himself on the day. Finally, he has taken part in the Northern Ireland Open in Derry where he achieved a gold medal. William is a very talented athlete with a great attitude and is certainly one to watch in the future in the world of Judo. The award from GLL will assist him with his strength and conditioning training through the gym membership and and a financial award will assist with the costs of events and training that will increase over the year. 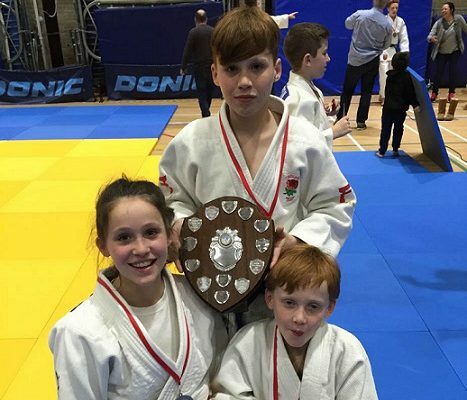 Talent runs in the family, with the photo showing William and his brother (Callum), and sister (Katherine) with their Sussex Championship medals and William with the trophy. We wish William all the best in 2016 and are confident he will improve his current GB ranking.